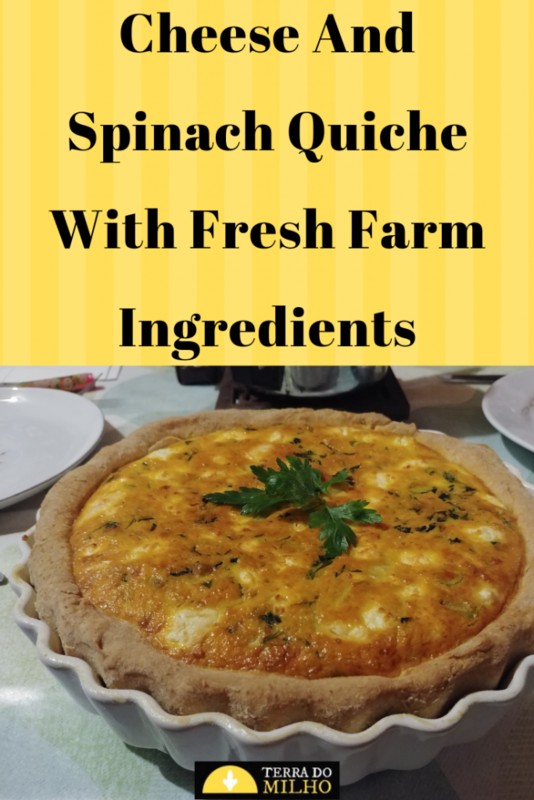 Home » Recipes » Cooking Cheese and Spinach Quiche with Fresh Farm Ingredients. 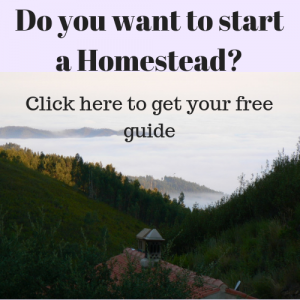 What happens in the kitchen during winter on a Homestead? Hence my cooking started with a slight anxious feeling trying to think of a suitable recipe for the available ingredients. How to cook with fresh farm ingredients ? When you start really thinking about your meal, the farm suddenly becomes your playground, like a giant pantry full of surprises, new flavours, odd fruits and vegetables, and you discover you have everything on hand already. Or you could just go and search on the internet (or browse Monique’s cabinet full of cookbooks) for a recipe with some of the main ingredients found on the farm. Beets, carrots, apple, potatoes and a freshly picked laurel leaf became beetroot soup. Potato, onion and picked leaf-cabbage became Korean pancakes accompanied by found-in-pantry soy-sauce with garlic from the land and homemade sambal. 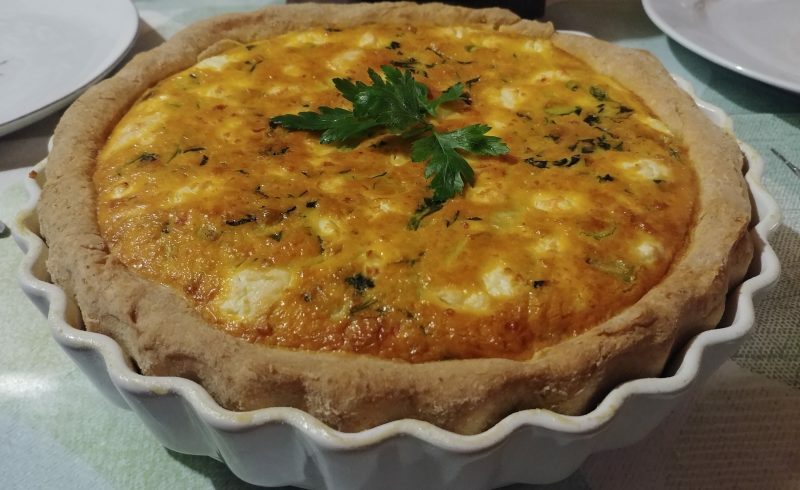 But the loveliest recipe of the first week was probably the goat cheese and spinach quiche. There are chickens on the land so for this recipe we only had to use flour, butter and cream that weren’t from Terra do Milho. Whisk the egg and water together in a separate cup or little bowl. Then in a larger mixing bowl mix the flour with the salt and mash in the butter with a fork, or use the blender until everything looks like crumbs. Add the whisked egg and water. If the dough is too sticky add the whole grain flour, if it’s too crumbly still, add some water. Butter the pie dish and sprinkle some flour on top, your quiche will come out easily! Spread the dough over the pie dish with a spoon (or with cold hands) and make holes in the bottom with a fork (no soggy bottom!). Put it in the fridge (this will ensure good baking results). Preheat the oven to 180 degrees Celsius. Chop your vegetables, the onion and the garlic in small pieces. Sautee the onions and garlic in some oil or butter and add the vegetables. Cook until done and drain the moisture out of the pan. Put all the vegetables in a strainer to drain. Whisk the cream and the eggs together very well. Season it and mix in the vegetables. Take the crust in the pie dish out of the fridge and fill it up with the filling. Set the oven timer to 30 minutes, or check until the quiche is a deep golden brown (see picture!). It may even take 40 minutes. Serve in the pie dish! For garnish just put some parsley on top, but it is also nice to eat fresh with the quiche. Good luck in the kitchen at Terra do Milho. There is always something that you will discover you can eat.